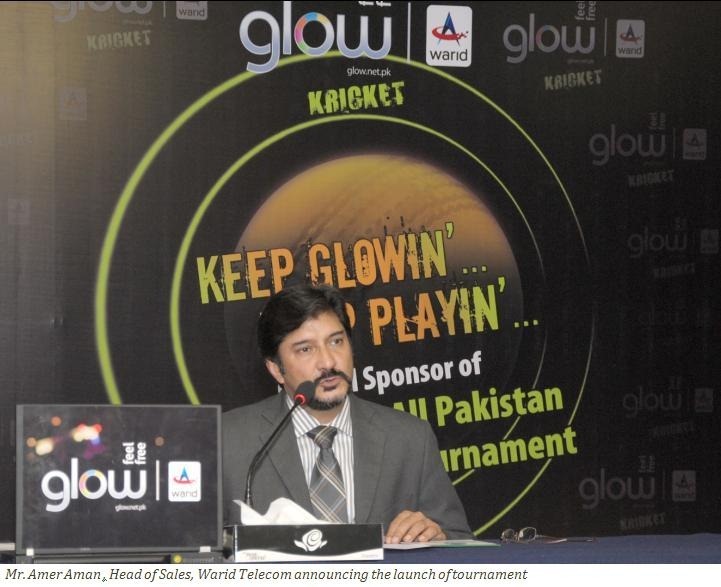 Warid Telecom today announced the launch of GLOW Kricket Tournament starting from 15th March 2011. Announcement was made in a press conference held this Monday in Royal Palm, Golf and Country Club, Lahore. This tournament is one of the largest events of such magnitude in Pakistan in which over 320 Universities and Colleges from all over Pakistan are participating with over 6000 players, 320 teams. This tournament is organized in collaboration with Punjab Olympic Association and will be played in 12 different cities of Pakistan. “At Warid we are always probing on the best options to support our talented youth and provide them with a platform that helps unleashing their talents. Our youth is strongly connected with cricket in Pakistan and we believe that this country is greatly rich in terms of its human capital, with the best talent in the world and certainly our youth is our future. By the virtue of our youth focused brand GLOW, we are deeply associated with the dynamic preferences of our youngsters. At the end we don’t just take it as ‘numbers game’ and our approach towards understanding our youth in true spirit is broader enough to bring them physical means. Glow is broadly admired by youngsters for its tailor made products and services. It is the most active brand of society that is involved in doing a lot of different activities to support the youth of Pakistan. Glow recently organized 3rd Inter School and Inter collegiate games in which over 225 schools and colleges participated. Warid Glow also sponsored ‘Pakistan Racer Hunt’ SLUMS (Sports Society of Lahore University of Management Sciences), GCU (Government College University), Superior Group of Colleges, FCC (Foraminate Christian College) and many others. To share cricket enthusiasm Glow also introduced a new SMS bundle, 100 SMS @ 50 paisas/day to any number, any network in Pakistan. Also an interesting IVR based VAS called ‘Fantasy Cricket’ is launched that can be accessed by calling 1200. This exciting service brings Warid customers more closer to live cricket experience. Fantasy Cricket is based on International Cricket series events including Test Matches, ODIs and T20s. The game offers lots of attractive prizes to game winners every month. Continuously exploring the best ways to serve the dynamic needs of active youth who always desire more from their connection, Warid Glow proves to be a brand full of energy that is unparalleled and smartly positioned to best cater the communication needs of our young leaders. Hi Pow, there are 12 diffrent cities it will be played in. All Major cities of Pakistan i belive. I am really impressed by this 320 Unis & Colleges and 6000 players :) My university is also the part of it and thanks to Warid for doing this great thing….